← Teachers in other states are striking. Texas teachers can’t do that. The project will include 20 miles of new bollard-style wall up to 30 feet tall, including five feet of climb-resistant material, Hull said. The new barrier will extend west from Santa Teresa, New Mexico — a town located about 13 miles northwest of El Paso — and will replace shorter vehicle barriers, which agents said are not effective to deter illegal crossers or drug smuggling. Hull said the Santa Teresa area was chosen for the initial groundbreaking because it’s one of the busiest crossing points in the sector. 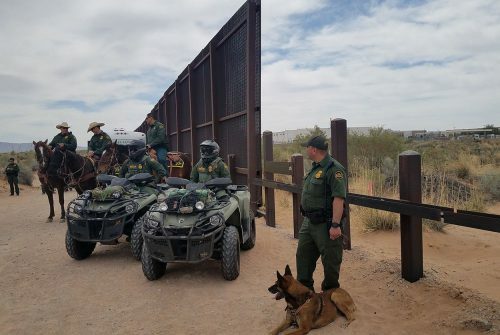 In fiscal year 2017, agents apprehended more than 25,000 undocumented immigrants and seized more than 34,000 pounds of marijuana and 140 pounds of cocaine throughout the sector. Agents also reported being assaulted 54 times during that fiscal year. This entry was posted in KRTS News, KXWT News and tagged Borderwall, Santa Teresa, texas. Bookmark the permalink.